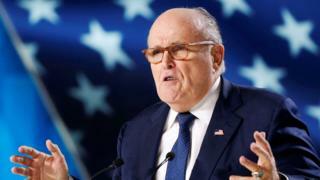 President Donald Trump's lawyer, Rudy Giuliani, has responded to a public backlash after he claimed that "truth isn't truth" during an interview. He said on Twitter that those words had not been "a pontification on moral theology" but referred to cases of "he said, she said". Mr Giuliani had said that Mr Trump should not testify to the Russia probe, as he might be "trapped into perjury". "Truth is truth", NBC host Chuck Todd remarked during Sunday's interview. Mr Giuliani denied that this was the case. The comments were widely mocked on social media. In January last year Trump adviser Kellyanne Conway told Todd's programme, Meet the Press, that the White House was entitled to present "alternative facts". In his response to his critics on Monday, Mr Giuliani reaffirmed that his point was that two rival versions of events were in contention. The exchange on Meet the Press on Sunday began with Mr Todd asking Mr Giuliani whether the Trump team was stalling about a possible testimony at the inquiry led by Special Counsel Robert Mueller into alleged meddling by Russia in the 2016 US election. Mr Giuliani said: "I'm not going to be rushed into having him testify so he can be trapped into perjury." He added: "When you tell me that he should testify because he's going to tell the truth and he shouldn't worry, well that's so silly because it's somebody's version of the truth. Not the truth." When Todd countered that "truth is truth", Mr Giuliani exclaimed: "Truth isn't truth." The interviewer put his hand on his forehead and said: "This is going to become a bad meme!" Mr Giuliani then made his main point - that accusations of obstruction of justice against the president hinge on a conversation he had with then FBI director James Comey in February 2017, and that Mr Trump's account of that conversation differs radically from Mr Comey's. Trumps critics were prompt to seize on the exchange. Preet Bharara, a Democrat who was fired as federal prosecutor by the Trump administration, suggested "truth isn't truth" would not sound convincing in a trial. Others shared Todd's sense of disbelief. Russia also denies claims it interfered in the polls two years ago, which saw Donald Trump defeat Democratic rival Hillary Clinton.